As we know, from a surprising corollary to Kirchhoff's law of thermal radiation, just as darker* objects absorb more light (and therefore energy), darker objects also radiate more light (at lower temperatures, in the infrared) and therefore energy. What this says to me is that these radiators are inefficient. From research for this question, I found that the consensus of the internet for terrestrial radiators (e.g. for heating) is that a dark coating isn't worth it: just use a larger radiator and, in the presence of an atmosphere, most heat transfer is by convection anyway. However, in space, efficiency is paramount. Someone needs to check up on all those panels, fix them up, repair damage when possible, &c.--to say nothing of lugging all those precious grams into orbit in the first place. If you could, say, put a carbon nanotube layer on them and use one fewer, wouldn't you? So my question is this: why, with the particular examples of the ISS and Space Shuttle, aren't radiators jet black? * Note: darker here is not necessarily in the visible range. If these panels have low albedo in the nonvisible range, for example, then that might be better than some blacker material with a higher albedo in the nonvisible range. This would certainly explain these radiators. Kirchhoff's law is only valid for objects in radiative equilibrium. The emissivity and absorptivity of a material are the same for a given wavelength, but can vary dramatically for different wavelengths. The radiators on a spacecraft are not in radiative equilibrium, since they lose heat to radiation. They emit heat in the longwave infrared spectrum, but receive heat energy (from the Sun) in the shortwave infrared, visible, and UV parts of the spectrum. (They do also receive longwave IR from Earth, but the amount is only around 250 W/m2 vs 1300 W/m2 for sunlight.) This means that the effective emissivity and absorptivity can differ while the radiators are in operation. 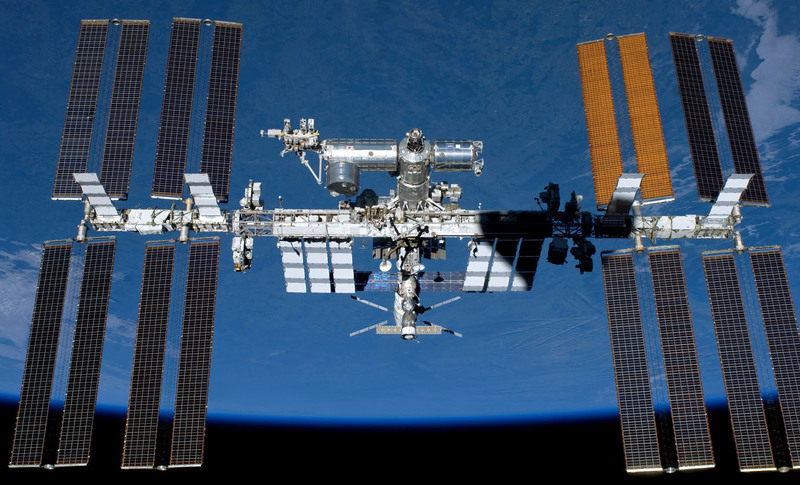 The radiators on the ISS are a high-emissivity white paint, meaning that they are dark in the infrared spectrum where the heat is emitted. They are white in the visible spectrum to reflect sunlight. The radiators on the shuttle are have a two-layer coating: a silver reflective layer covered by a thin Teflon film. The Teflon layer is opaque to infrared light, so the high emissivity of Teflon dominates. Visible light passes through the Teflon layer and is reflected by the silver layer, so the solar absorbance is low. 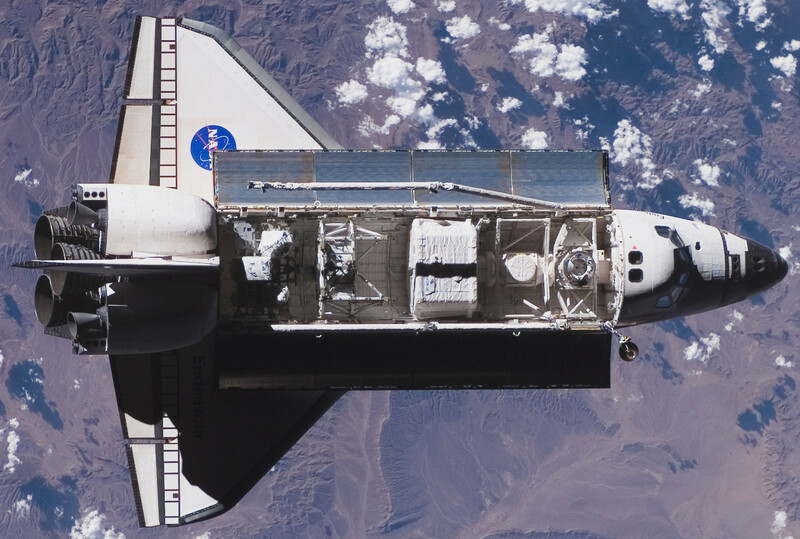 The radiators on the Shuttle are exposed to more direct sunlight (the radiators on the ISS pivot so they are typically close to edge-on to the Sun), which is why they use the higher-performance but more expensive dual-layer design. Not the answer you're looking for? Browse other questions tagged iss materials physics radiators thermodynamics or ask your own question. Why aren't the ISS HDEV cameras left on at night? Why aren't orbital vehicles made of plastic?